Welcome to our new product range at Plytech! Here, you can explore FiberTite single ply membranes that will meet the needs of any roof. The products we sell function together as a whole and when installed correctly, FiberTite can outcompete almost if not all other roofing membranes. The core product that we import from Seaman Corporation is the 36 mil (0.9mm) FiberTite. This single ply membrane was first introduced in 1979 and FiberTite still uses the original, proven formulation now. The membrane features an 18 x 19/ 840 x 1000 denier weft reinforced polyester knit fabric and is coated with a proprietary compound. This membrane not only exceeds the ASTM minimum standards, but also meets, and even exceeds the physical properties and performance of most 60 mil (1.5mm) membranes currently on the market. Vertically integrated to ensure control during the manufacturing process right through to the final coating process, FiberTite single ply membrane is the result of 60 years’ hard work in fabric engineering and coating technology at Seaman Corporation. We trust that this product will be the perfect fit for our customers! We have also begun importing Seaman Corporation’s 36 mil FiberTite-FB “fleece back” membrane. This is similar to the regular 36 mil (0.9mm) membrane, however, it incorporates a 4-oz per sq. yd (135g per sq. m) non-woven polyester felt, which is bonded to the back side of the membrane with a 75mm selvedge edge for field welding. Our FiberTite simulated metal roof profile is another new product in our range; it will help banish any fears you may have about the reputation of metal roofs being prone to leaks. These patent-pending simulated metal roofs provide the look of metal with a proven long-term track record and heat-sealed seams to provide the ultimate leak protection. Each of our new FiberTite single ply membrane products is unique and incredibly reliable. The most important aspect of our new product range is the KEE element, which makes FiberTite membranes stand out from other single ply membrane products on the market. The KEE element maximises seam strength, as well as the overall membrane performance. It challenges the widespread assumption in the industry that ‘the thicker the membrane, the better’, as a true KEE membrane doesn’t have to be thick to prolong the migration of plasticisers out of the sheet while also staying flexible. The strength of the membrane depends on its fabric, not its thickness and with a KEE coating, the extra dense fabric has the best chance of remaining coated. What’s more, KEE membranes have been proven to endure and sustain performance within the harsh environment of your rooftop in terms of water absorption and they have been shown to excel as waterproofing membranes. KEE membranes are excellent water and chemical resistors and are also known to maintain their flexibility, meaning we know the FiberTite single ply membrane is a great choice of for any project. FiberTite KEE membranes do not use phthalates as a plasticiser in the range of single ply roofing membranes. The negative impacts of phthalates on our health have been widely reported on. Research has linked this group of harmful chemicals to a variety of conditions and diseases, such as asthma, breast cancer and diabetes. What’s worse is their prevalence in our everyday lives, in a whole range of places from food packaging like plastic milk cartons to cosmetic and hair care products. Therefore, we think it’s important to help take a stand against phthalates in any way we can. All of our new products feature a DuPont product called Elvaloy in place of phthalates. 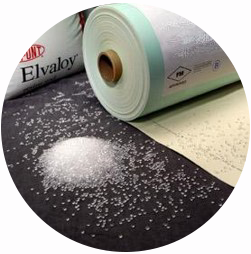 Elvaloy is used in polymer modification, as it can increase membrane toughness as a low-temperature impact modifier. Its application leads to fewer breakages during preparation, distribution and use, helping to reduce waste and costs. It also increases stability, which can further reduce costs. Most importantly, Elvaloy doesn’t hold the alarming health risks of phthalates, making it a suitable addition to our FiberTite single ply membrane products. Click here to find out more about our FiberTite range. For any questions, please feel free to get in touch.